In this week's newsletter we announce the next project in our scarf journey. We’re going to work a lovely spring scarf that you can wear all season long: Midwest Moonlight, which is also from Scarf Style. Midwest Moonlight. This design has tremendous appeal for a variety of reasons. First, it’s a wonderfully open and lacy stitch pattern that is beautiful but decidedly unfussy. Second, it's deceptively simple to execute and very intuitive to memorize. Finally, it’s easily scaled. What that means is that you can make it as is (10” wide) or you can, as Lynne has done, work a longer, narrower version. You might want to turn Midwest Moonlight into a luxurious summer shawl that will keep your shoulders warm all spring and summer, and then look chic scrunched into a cozy scarf for the fall. Paula has done several versions of this scarf and has even turned it into a spectacular baby blanket. This stitch pattern will give you a Karate Kid kind of understanding for left-leaning and right-leaning decreases. Knit a Midwest Moonlight, and you will never again wonder how or why to execute either variety of decrease! 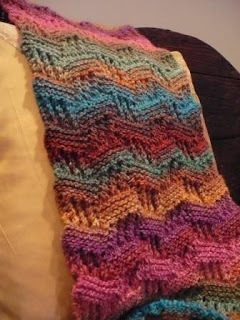 For my Midwest Moonlight, I’ve chosen Noro Aya, a lovely light worsted cotton and silk blend in really luscious colors. Other choices would be Shirikaba, the spectacular new linen and cotton blend, or even beautiful Hempathy. The idea is to choose a fiber you'll be comfortable wearing in the spring and summer. This will certainly be a go-to accessory that you'll choose to liven up you wardrobe all summer and into the fall. I’m very excited to get started on this. Join us Thursday, March 24th for the kick-off.